Posted May 14th, 2015 at 3:25 pm. From left: Patricia Burland, MSS ’56; Allyson Schwartz, MSS ’72; Congressman Chaka Fattah; Dean Darlyne Bailey; Tawana Ford Sabbath, MSS ’71, PhD ’86; Bryn Mawr President Kim Cassidy. The Bryn Mawr College Graduate School of Social Work and Social Research recently launched its year-long 100th birthday celebrations at an on-campus reception for alumni, School and College administrators and faculty, students, and visiting public officials including Congressman Chaka Fattah, Katie Morton, who represented State Senator Daylin Leach, and Mike Bettinger, chief of staff to State Representative Tim Briggs. 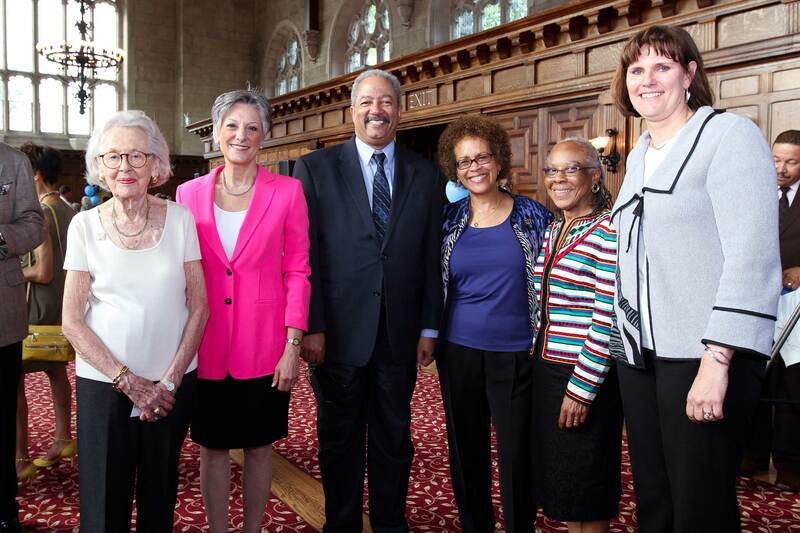 Bryn Mawr College President Kim Cassidy praised the School’s history of innovation and continued excellence of its professional social work education, as well as the impressive legacy of its 4,480 graduates. “They have greatly improved the health and well-being of individuals, families, communities, and organizations throughout the Greater Philadelphia Region, across the nation, and around the globe,” she said. Judith Kasser, MSS ‘65, Founder, PA Society for Clinical Social Work, for Distinguished Service (Posthumous), accepted by Pat Burland of the Society.